Now that the first session of the 113th Congress has passed into history, it seems appropriate to take another look at its productivity, or lack thereof. We first did this back in September, when we examined how many substantive laws had been enacted by that point in the year and compared the current Congress to the previous seven. (We deliberately chose an expansive definition of “substantive,” excluding only purely ceremonial legislation such as post-office renamings and commemorative-coin authorizations.) At that time, we concluded that while the current Congress was “on track to be one of the least productive,” it hadn’t quite made it there yet. 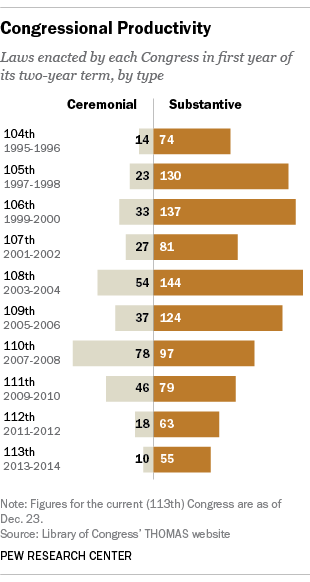 However, as of today (and after extending our analysis back to the 104th Congress of 1995-96), the 113th has passed fewer substantive measures than any Congress in two decades — just 55 laws, versus 63 in 2011 (the first year of the 112th Congress, itself one of the least productive in recent history). Overall, the current Congress has enacted only 65 laws, according to the Library of Congress’ THOMAS website and the White House’s log of signed legislation. Of course, there are other ways to measure Congress’ job performance. House Speaker John Boehner has said that Congress “should not be judged on how many new laws we create, we ought to be judged on how many laws that we repeal,” though it bears noting that that would require passing a repeal measure, which itself would count as substantive legislation by our definition. At any rate, the current Congress hasn’t repealed any laws either (despite dozens of votes to repeal or defund the Affordable Care Act). Earlier this month, The New York Times calculated that the House had been in session a total of 942 hours in 2013 (not counting brief pro-forma sessions) — “the fewest hours in a nonelection year since 2005, when detailed information about legislative activity became available.” By contrast, according to the Times, the House was in session 1,200 hours in 2011, 1,350 hours in 2005 and nearly 1,700 hours in 2007. However, the National Journal argued that much of the work of members of Congress takes place off the floor.